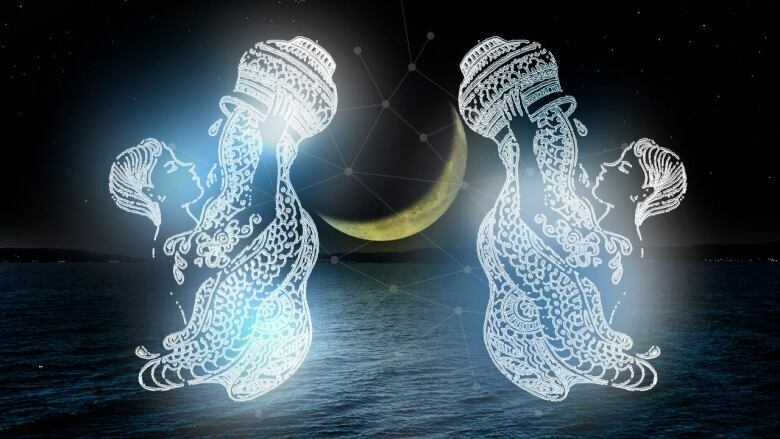 A New Moon in Aquarius provides the impetus to break away from unpleasant memories. New Moons bring hope and renewal. They inspire us with a spring-like feeling once a month. The good news is that the week begins with a New Moon in Aquarius, on Monday. So get ready to pick up a surge of proactive energy. Jump on your surfboard and leap onto that wave when it sweeps in. Aquarius is ruled by Uranus. Independence and freedom are the key words here – and yes, revolution is part of the message too. The Aquarian New Moon will provide the impetus to break away from all your unpleasant memories of the past. Relationships are up for review. The theme now is to be your own person without feeling guilty. Look toward the west around sunset. A super-thin, gondola-shaped crescent Moon will be hovering over the horizon as the golden orb of the Sun dips down out of sight. As the days unfold, the waxing Moon will grow in size and set a little later. And the good news doesn't end there. The week ends with a series of hopeful connections. The Sun and Jupiter form a lovely sextile (60-degree angle) on Thursday, just before Mercury and Mars do exactly the same. Saturday brings another sextile between Mercury and Uranus. There's even a chance for romance as Venus and Neptune connect in sextile on Sunday. It will be a great time to meet up socially with friends, family and business associates. Here is your horoscope for the week of Monday, February 4, 2018. Making final decisions is sometimes the hardest thing to do, especially when the stakes are high. The Aquarian Full Moon will help you see all the angles like a master snooker champion, and understand the ramifications of a step that needs to be taken. If possible, it helps to have an exit cause just in case circumstances change and you need to modify your goals. Life is always a work in progress. Build your strategies. Be adroit at adapting to change. The Aquarian quality of this New Moon will show you how get it exactly right. Turbulent celestial seas recently put you under a great deal of pressure. The stress and tension of a tough scenario is easing as result of your ability to control anxiety levels. You have learned that worrying and fretting do not help. They only succeed in causing more aggravation. The Aquarian New Moon is ferreting out some useful information that will come to your attention this week. What you learn will ease the pressure and introduce you to a clever solution. You are big and your problems are small. You would appreciate more recognition of the value of what you have achieved, and the potential of what you are destined to accomplish. Do not lose faith in yourself. The Universe has been putting you through a series of exasperating tests for your own good. They have made you wiser, stronger and more determined. The Aquarian New Moon this week will demonstrate how you are successfully advancing towards a long sought after dream. Your intrepid spirit is the key that will unlock the door into a new age of joy. No matter how hard we try to do the right thing, we sometimes come up short. Success can never come fast enough. The Aquarian New Moon this week will get you past a situation that's blocking you, and lead you into a most liberating chapter — potentially, one of the most enjoyable of your life. A cloud that looms over you will reveal its silver lining. You will no longer accept scenarios that are best avoided. So, steer your ship away from trouble and towards the land of eternal happiness and joy. It's out there somewhere. You're on a mission to find it. In light of so many auspicious indications in the heavens, you are advised to distil your list of goals down to the most essential ones. This doesn't happen often – aren't you the lucky one? The week's Aquarian New Moon will make it clear that your personal power is growing. Conditions are ideal for successfully nurturing your most treasured dream. The sky is willing to grant one big wish to start with. Your good fortune comes with one simple caveat – choose judiciously, so as not to squander this huge opportunity. Some people are slick and convincing, but lack substance. That is certainly not you. You've been working laboriously towards a most noble goal. People gifted with seductive charm and charisma seem to reach their goals faster, but how long can they stay there before they're exposed? This week's Aquarian New Moon will make it clear how people love to be with you. You're honest. You're driven. You've got guts and a sense of humour when it's needed. That's all you need to succeed. You've got it all. Dig deep down into your intuition and allow yourself to trust it. The Aquarian New Moon will assist you in finding an escape route from a dilemma. A series of innovative ideas will come to your attention. It's funny how we become inured to difficult conditions. I suppose it's for our own good, but, finally and at last, you will find that a happy ending to a troubled tale is available. Sidestep your fears and you'll convert negative energy into positive determination. A certain precious, but neglected objective is within reach. A particularly sensitive situation is causing you some angst, but this problem-solving Aquarian New Moon will guide you to some useful avenues to explore. It will help ascertain the role you play within the aforementioned process which is far bigger than you currently realize. Uranus is cracking open a window of opportunity that will inspire you to clear a mountain of emotional baggage. It's a process that will lighten your load and set you free. Reasons for feeling positive about your future are too numerous to count. Self-doubt and lack of confidence are pernicious emotions that undermine our ability to reach our objectives. An unconscious attitude of self-deprecation is stopping you from achieving your full potential. The New Moon in Aquarius will direct you toward identifying and eliminating some negative thought patterns. You will turn your life around overnight. Get ready for at least one revelation that will totally alter your perspective. Success is in the neighbourhood and she's come around for a visit. Put the kettle on. You have been experiencing a temptation to push through a plan or strategy as fast you can, just for the sake of getting it done. Something awkward that cropped up forced you to change plans. The New Moon in Aquarius will clear away the stops and blocks that have been holding you back. It's okay to be impatient, just don't let anxiety get the best of you. What now seems like a hindrance will ultimately prove most fortunate. The method behind the apparent madness of this Universe will come to light, if you keep your spirits your determination fired up. We all make bad decisions. Nobody is perfect. The trick, though, is to bounce back fast. This week's Aquarian New Moon will show you how to turn negatives into positives and fix what's wrong. It's true that an apparent mistake has led to a frustrating impasse, but it was a necessary and unavoidable stage in your path to success. The error has unwittingly escorted you onto a faster road, to get you to where you want to be. A hidden benevolent energy is guiding you. You've learned a lot. Much more than you realize. Nothing can stop you from getting to where you want to be.